It’s written in the very name. A helmet for riders unafraid of what happens when the trail ends… or perhaps when there is no trail at all. It has been a long time coming, but Bell is now officially making waves in the dual sport world. 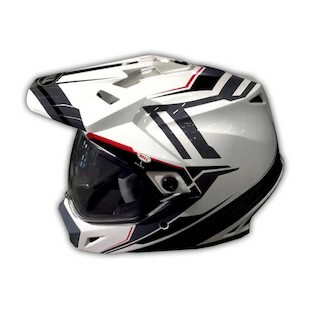 Welcome to the road, or trail, or wherever, the new Bell MX-9 Adventure Helmet. This lid will come equipped for all that riders need, no matter where they direct their two-wheeled machines. With the ability to remove the peak entirely for better aerodynamics, or to take away the face shield if riders want to go full dirt, there is a lot that can be done to accommodate differing styles and needs. Three shell sizes in the lightweight injected polymer composite shell work to offer a comfortable fitment along with the velocity-flow ventilation system and the removable/washable moisture wicking internal liner. Additional features include an adjustable mouth vent, padded chin strap, and 5-year warranty. Bell has been making top-tier helmets for decades. Now they are ready to add to their vast catalogue with the introduction of a new DS helmet. If you are a rider who is looking to aggressively go after every road, path, trail, or timber road… the MX9 Adventure has you covered.